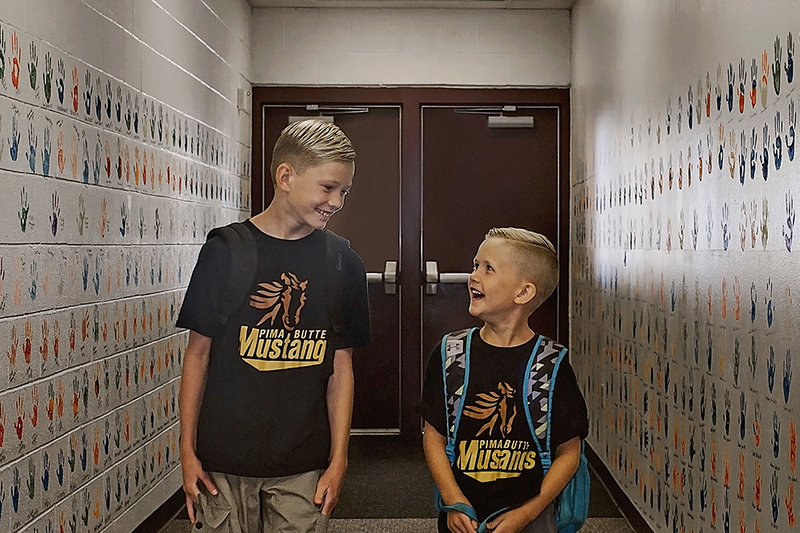 Brothers Brody and Madden Rastad are never far away from Mom, even at school. Brody, 9, is entering fourth grade at Pima Butte Elementary School, where Madden will be a first grader and their mother, Yurosha Rastad, teaches second grade. “We high-five each other in the hallway,” Yurosha Rastad said. Brody and Madden are two of more than 6,300 students returning to Maricopa Unified School District for the 2017-18 school year. Brody said he is happy about getting back together with friends at Pima Butte and its nice teachers. “Everyone gives you a chance to do something amazing,” he said. While Brody thrives in math, Madden, 6, said he liked the ABC Countdown in kindergarten and is excited about heading into first grade. Like her sons, Yurosha Rastad has best friends at Pima Butte. Several had children around the same time and now see them as students in the hallways, too. All three Rastads will be back in their family-within-a-family when school starts Aug. 7. Some things might look a little different, though. At district and charter schools a new school year brings some surprises. In addition to its high school, two middle schools and six elementary schools, Maricopa Unified School District will open an alternative school, Ram Academy. The district will implement a newly-adopted math and reading curriculum as well as a new testing platform across each of its schools. With the successful passage of the budget override last year, MUSD hired 50 new teachers and gained new technology for classrooms. The district will see a slight change in its calendar, but won’t see a completely modified schedule until 2018. Classes for all MUSD schools begin Aug. 7. Maricopa High School will receive six override teachers, and Ram Academy will receive seven. The high school’s sports programs will be headed by former Athletic Director Brian Winter, who replaces Mark Cisterna. Its alternative school will be run by Assistant Principal Steve Ybarra with an estimated enrollment of around 125 students with credit deficiencies. The 2017-18 school year will see Maricopa Wells and Desert Wind Middle Schools reintegrating sixth-grade students. Sixth graders were transitioned into district elementary schools four years ago. Maricopa Wells Middle School Principal Rick Abel said his school will receive six new teachers from override funds and eight sixth-grade teachers who previously taught at MUSD elementary schools. Abel said enrollment at Maricopa Wells will be 850 to 900 students by the time schools begins. The middle school will acquire a full-time assistant principal in Thad Miller. Desert Wind Middle School will absorb around 200 sixth graders in August. Half of the positions funded by the override will be dedicated to elementary schools, including three counselors, one librarian and one teacher on special assignment. MUSD elementary schools are reconfiguring as they return to the K-5 model. Pima Butte Principal Randy Lazar said his school’s enrollment dropped by 60 students from the sixth-grade transition, and he anticipates an enrollment of 480 to 490 students. Lazar hopes to keep key grades, like kindergarten and third grade, between 20 and 22 students per class. Pima Butte, Santa Cruz and Butterfield Elementary schools will implement the Positive Behavioral Interventions and Supports initiative. The schools received the grant and subsequent training for the program last year. PBIS promotes schoolwide expectations for student behavior. Maricopa Elementary School will attempt to be one of four of schools in Arizona to become a “Light house school.” The process involves a readiness review in October that focuses on the school’s “culture, academics and environment,” said MES Principal Jennifer Robinson. Leading Edge Academy implemented a waiting list in some grade levels for the first time this year. Principal Mat Reese said the school is near capacity at 776 students. The charter school offers K-8 instruction and an online high school. Reese said new reading and math curriculum will be introduced this year as well as two new fulltime physical education teachers and a new dean of students, Sherreis Moreland. Assistant Principal Rachele Reese will shift her responsibilities from the elementary to the junior high, and Moreland will eventually take over discipline. Facilities at Leading Edge will get upgrades, including a ramada with picnic tables, new art room inside the cafeteria and additional classrooms for first, second, fourth and fifth grades. The first day of classes is Aug. 3. The campus director at Sequoia Pathway Academy is not the only new addition to the school. Alfonso Alva, who came on board over the summer, said Pathway is adding four advanced placement classes: AP Literature and Composition, AP Psychology, AP Biology and AP Studio Art. The school will also introduce a new music teacher and an expansion of its art program with a 3D studio arts course. Legacy Traditional School started classes July 24 after adopting a modified schedule that adds an additional week to fall and spring breaks. A teacher pay raise also went into effect, and Dino Katsiris joined the administration. Principal Amy Sundeen said they are adding a yearbook elective in junior high as well as a robotics club and culture club.